If you’re the type of person who wonders what The Sound of Music would be like if it included a zombie dance sequence, The Happiness of the Katakuris is the answer. The dark comedy with musical numbers and trippy claymation sequences was directed by Takashi Miike in 2001, as a much lighter entry compared to his other films during that period (include 1999’s Audition). And yet, it still has the distinct stamp of the filmmaker, particularly in the moments of macabre. The best comparison I can make is that The Happiness of the Katakuris is to Miike’s filmography what The Trouble with Harry was to Alfred Hitchcock’s. After opening with a bizarre fantasia claymation opening sequence, we join the Katakuris family living in the country attempting to run a mountainside Inn. Though they haven’t had a single customer, the family patriarch Masao (Kenji Sawada) is hopeful that rumors about a new road being built will bring them untold fortunes. When they finally do begin to get clients, they all coincidentally end up dying in the guest rooms. Though it is no fault of the family, Masao worries that the recent trouble his son (Takedo Tetsuro) has had with the law will make him a likely suspect. He is also concerned about the reputation of the hotel, so the family conspires to keep the accidental deaths a secret by burying them in the nearby hills. Meanwhile Masao’s recently divorced daughter (Naomi Nishida) finds herself wooed by a con artist wanted by the police. For whatever reason, this family is chased by tragedy, from inexplicable deaths and visiting criminals to a sudden natural disaster. Somehow even with all of this dark humor, Miike manages to keep the film feeling more like a musical than a horror movie. It is a weird little film that inspired Lloyd Kaufman when he made Poultrygeist, but is unlike most any other film, American or Japanese. 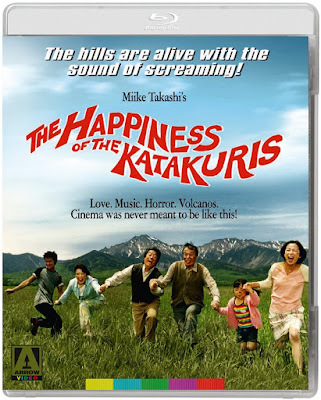 As often happens with uniquely strange films, The Happiness of the Katakuris developed a loyal fanbase which will be pleased by the treatment of the film on its Blu-ray release. The new high definition presentation looks fantastic, especially when the film gets into its most bizarre and stylized moments of musical number fantasies and psychedelic animation sequences. There is also a bounty of new special features, highlighted by a making-of documentary and a director’s commentary from Miike. Also included is a featurette about the film’s animated sequences and interviews with the cast members. There is also a trailer and TV spot collection. Note: Although it wasn’t included in the review copy sent to me, the final product is said to also include a booklet insert with new writing on the film by author Johnny Mains and a reprinted interview with Miike, as well as a reversible sleeve.